Eliminator Weed and Grass Killer is a product of Chemsico United Industries Corporation, kills over 175 varieties of weeds and is sold in a liquid concentrate that requires dilution. The product is for use outdoors only in and around flowerbeds, trees, shrubbery, walkways and driveways to eliminate weeds. This product has specific warnings that need to be followed in order to keep pets, children and your water system safe. Always read the entire label before applying this product. Eliminator Weed and Grass Killer is a post-emergent, non-selective translocated herbicide that acts on growing weeds rather than on weed seeds. It can be used to treat small or large areas. The plant absorbs the product through its leaves or stems, killing it by interfering with its metabolism. In contrast, non-translocated herbicides, such as contact herbicides, kill only the plant parts on which they are sprayed; re-growth can still occur from roots or unsprayed buds. 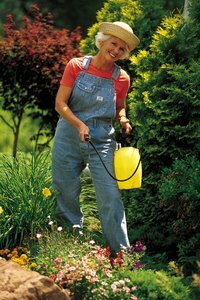 Eliminator Weed and Grass Killer should be diluted by adding 2 1/2 fluid ounces or 5 tablespoons of the product to 1 gallon of clean water in a plastic or stainless steel tank sprayer. To use a dial hose-end sprayer, follow the guidelines on the package to dial in the correct product to water ratio. Two-and-a-half fluid ounces in 1 gallon of water will treat 300 square feet. Do not mix in a galvanized container or watering can to apply this product. The product should be applied in warm, sunny weather, with the temperature above 60 degrees Fahrenheit. After the product is properly mixed, completely wet the plants you want to kill. Avoiding over-spraying, because this product will kill any vegetation with which it comes into contact. One application is sufficient for most weeds, with signs of death in two to four days. Larger plants or particularly hardy weeds may need a second application after one to two weeks. Treated vegetation should not be disturbed for seven to 10 days after treatment and should not be placed in a compost bin. As with most synthetic or chemical herbicides, keep out of the reach of children. Do not store this product in any container other than the one you purchase it in, in order to keep accurate usage and warning information. This product is hazardous to humans, domestic and non-domestic animals if ingested and is harmful if absorbed through the skin or comes in contact with your eyes. Thoroughly wash your hands after use. Keep children and pets away from treated areas until the spray is completely dry. Do not spray near potable water supplies and be aware that run-off containing this product can potentially remain hazardous. The active ingredient in Eliminator Weed and Grass Killer is glyphosate isopropylamine salt, a synthetic herbicide. Effective on a broad range of weeds, this herbicide must be used with caution to avoid killing or damaging surrounding plants. Glyphosate isopropylamine salt makes up 41 percent of the product, with inert ingredients making up the remaining 59 percent.